When we first started on the combat side of the game, Mina used a ladle and pan. Long story short, we ditched that and accepted that our game was just going to be a little more violent (sorry kids!) and gave her proper knives. There will be no “oh that critter isn’t dead it’s just sleeping” going on here. You’re going to hunt monsters and cook them and it’s going to get rough! I typically work directly in Photoshop for even the rough draft of animations which I did for the cooking animations but this time around I decided to draw a few key poses by hand. I definitely draw faster on paper and can create poses much better since I don’t stress over the drawings as badly as I do when working digitally. The next step was quickly chopping the drawings out and getting them into Unity so I could quickly see if they were working well. The below GIF demonstrated a loose idea of how I wanted the timing and positioning to work for Mina. I also included quickly animated slash effects to better convey timing, distance, and the sense of power with the attacks. From there I got back to Photoshop and started to adjust my proportion mistakes, fix any poses that were off model (I often start drawing more compact and then began to scale up and lengthen limbs ever so slightly when I’ve loosened up so I always need to refer back to my first few drawings), and change some poses to be more visually appealing. For instance, later on I didn’t like her strange prey-mantis like way of holding daggers so I adjusted it. As a tangent, I also couldn’t help myself from coloring the first frame so I could make sure the sprite was going to look good overall. So far, I’m going with a colored line and no real shading but the dark brown shadows. After crudely scaling, rotating, and nudging the key pose sketches around I then felt it was safe enough to begin doing in-betweens. I didn’t quite like the ending of her slash combo so on the fly I experimented with different endings and the one I settled on was what you see in the next GIF. I try to imagine the motions in my head first and sometimes might act out the movements a bit (just with my arms while still sitting in front of the computer) to make sure the attacks flow correctly between the character’s right and left hand. I have always been a fan of dual weapons. 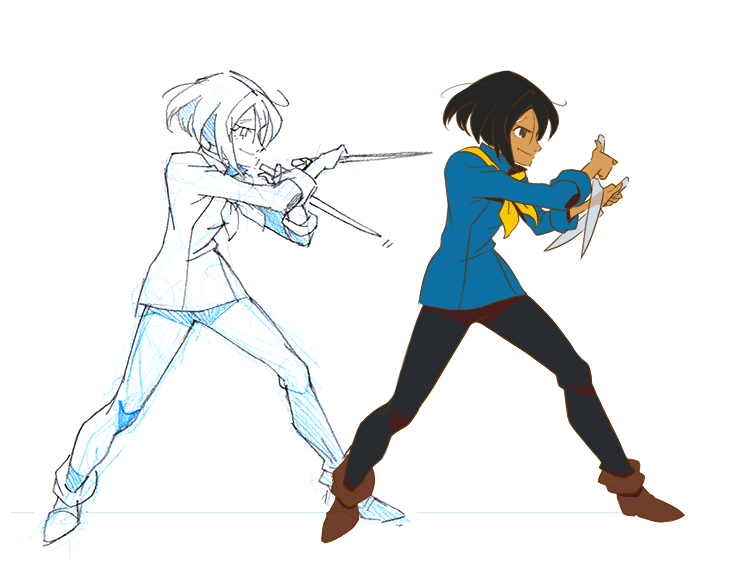 It’s not that I intentionally channeled these characters when I started animating, but after the fact as I reflected on this preference I started to think of Taki (Soul Calibur), Ellis (Battle Arena Toshinden), and while she doesn’t have weapons, the almighty, swift, and spinning Chun-Li (Street Fighter… of course). There’s probably a slew of other fast dagger wielding characters from countless games, anime, and so on that could be brought up in comparison. After I felt happy with the way the movements flowed and their timing I got to making cleaner lines and also fixing a few remaining pose and timing problems at the same time. In the next GIF you can see her actions more clearly and I also slowed down the animation for my own clarity while working. What you see there is probably the first combo that will make it into the game; a basic 3 hitter. The flourishes and special ending would be something I’d like to add if I have time. 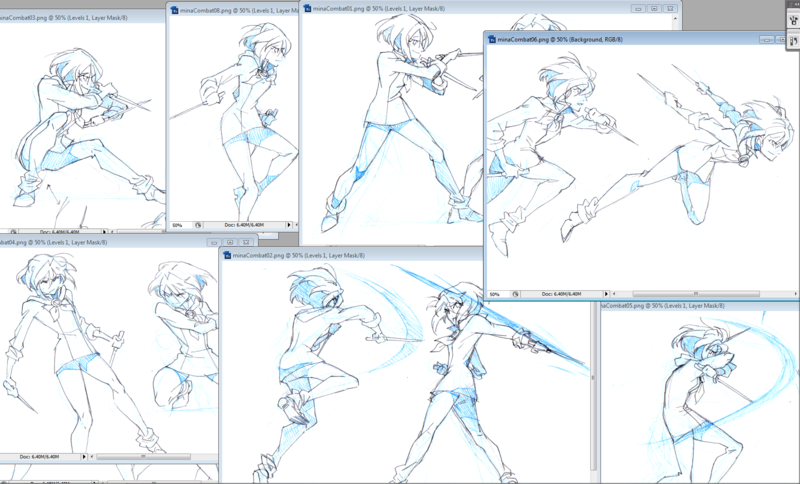 That’s where Mina is now in her combat progress as far as art production. There’s still a lot more to do as far as even a line art stage, such as an idle, run, jump, and more, as you could imagine. Let’s hope I can stay on top of all these tasks and give Mina a proper set of animations come demo showcasing time! You can tell so much hard work is going into this! The attack combos look spectacular. I especially like the finishing moves. Keep it up!! Hopefully I can get some special moves in faster than all the basic attacks are taking. Thanks Tom! These look amazing! The movement and timing you have here gives her so much life. Heavily anticipating idle and run, maybe a taunt? Thanks Ian! Idle will be one of the last animations to come because it doesn’t serve much gameplay purpose like running and attacking do, but I can’t wait to see her come to life through idles too!